Dreaming where to go with your AAdvantage miles? Want to go on that dream vacation with your American Airlines’ AAdvantage miles but not sure where you can fly? Redeeming miles for flights just got easier now that American has launched the new Award Map, powered by our QPX™ Reward Shopping feature. This new tool helps users quickly and easily search for and book award travel using their AAdvantage miles. Users simply search with criteria, such as destination category by region or interest, and the miles they wish to use, in addition to regular search parameters like their departure airport, dates of travel and cabin preferences. Behind the scenes the QPX Reward Shopping engine quickly computes a huge number of possibilities to present the user with all available award flight options within their desired mileage amount. 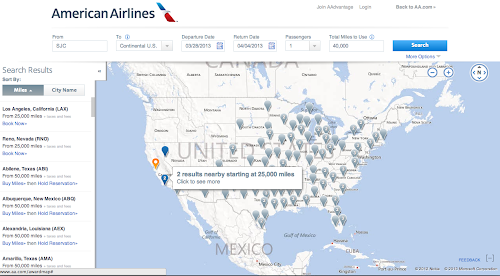 Available destinations are then displayed on American’s intuitive Award Map, making it easy for travelers to evaluate all their options and book using their AAdvantage miles.